Loyola University New Orleans College of Law alumnus and retired Louisiana Supreme Court Chief Justice Pascal F. Calogero Jr. is the recipient of the 2008 Integritas Vitae Award. The Integritas Vitae Award is presented by Loyola’s board of trustees to an individual who exemplifies the qualities Loyola seeks to instill in its students. The recipient is chosen for displaying high moral character and selfless service without expectation of material reward or public recognition and adhering to the principles of honesty, integrity, justice and the preservation of human dignity. 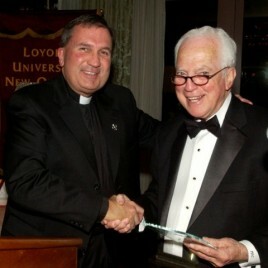 Calogero was honored at Loyola’s Benefactors Dinner on March 12 at the Windsor Court Hotel in New Orleans. “What a wonderful recognition and accolade from my university, Loyola, which is responsible for whatever success I have had in my legal and judicial career,” said Calogero. Calogero received a juris doctor from the College of Law in 1954, where he graduated first in his class and was president of the student editorial board of the Loyola Law Review. While a student at Loyola, Calogero was the recipient of the Henry L. Sarpy Award for Excellence in Civil Procedure and represented the St. Thomas More Law Society in Moot Court competition. He received a master of laws degree in the judicial process from the University of Virginia. Calogero served in the United States Army from 1954-1957 as a military police officer and then as an officer in the Judge Advocate General’s Corps, rising to the rank of captain. Calogero worked as a law clerk to the judges of Civil District Court in Orleans Parish in 1957 and from 1958-1972 with the law firm of Landrieu, Calogero and Kronlage, before being elected to the Louisiana Supreme Court in 1972. Calogero was reelected in 1974, 1988 and 1998 from the First Judicial District, consisting of Orleans, Jefferson, St. Bernard and Plaquemines parishes. As the senior member of the court, Calogero was sworn in as chief justice of the Louisiana Supreme Court on April 9, 1990. As chief justice, Calogero spearheaded numerous reform initiatives in the administration of justice in Louisiana, many of which serve as national models of court improvement. Throughout his career, he participated in more than 6,000 oral arguments and published Supreme Court opinions and authored more than 1,000 majority opinions, concurrences and dissents. After a tenure exceeding that of any judge in the history of the court, he retired on Dec. 31, 2008. Calogero received the 1991 Louisiana Bar Foundation’s Distinguished Jurist Award and an honorary doctor of laws degree from the Loyola University School of Law. In 2005, he became one of the first inductees into the Louisiana Justice Hall of Fame, and in 2007, the American Judicature Society awarded him the fourth annual Dwight D. Opperman Award for Judicial Excellence. In his honor, the Louisiana Bar Foundation instituted the annual Calogero Justice Award, which recognizes a local, state, or national organization or individual who significantly contributes to Louisiana’s justice system. As a Loyola alumnus, Calogero has judged law student Moot Court competitions, served on the College of Law Visiting Committee and taught as an adjunct professor at Loyola. He has also lectured to law classes at the University of New Orleans and Harvard Law School. For more information, contact James Shields in the Office of Public Affairs at 504-861-5888 or jshield@loyno.edu.